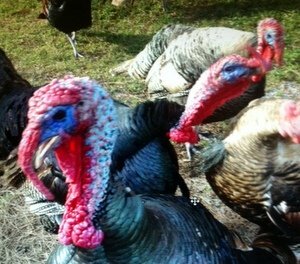 Here at Central Florida Pet Turkeys (Catchy internet name) We are always trying to place new & rescued birds to pet homes. 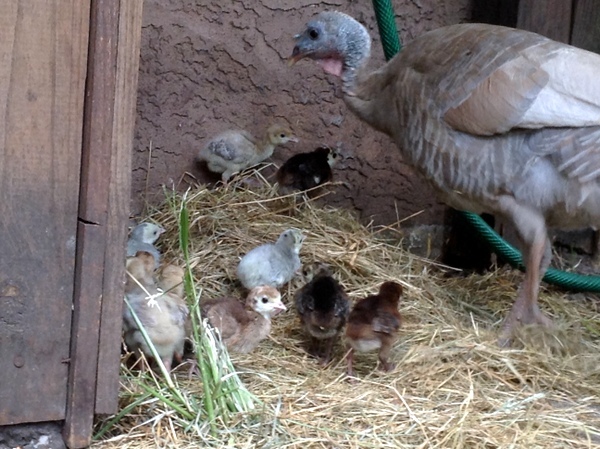 However, it would not be fair if we did not warn you that there are valid reasons NOT to own or raise turkeys. In fact I encourage you to run away never to return if you are not 100% ready for heritage turkeys. Size: As one of the largest Native birds in North America, the turkey requires more room than the normal back yard fowl. 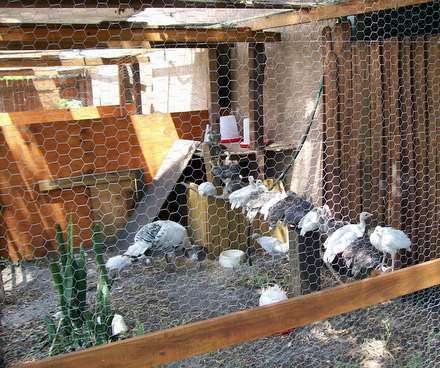 Turkeys require larger pens, larger and taller roosts and room to graze. Do you have the space? Mess: *(Manure) Like all birds, turkeys poop a lot, you could even say, “all the time”. The Turkey’s high burning metabolism requires they eat often and what goes in, come out processed turkey style. We scoop up the messes then bury the dropping and old feathers in one of our three organic gardens. Cost: (More feed and specialty feeds) Turkeys simply cost more food than normal barnyard fowl. Even through free range birds supplement their diet with fresh grasses, berries and acorns, their size and metabolism mean these inquisitive birds require more food. 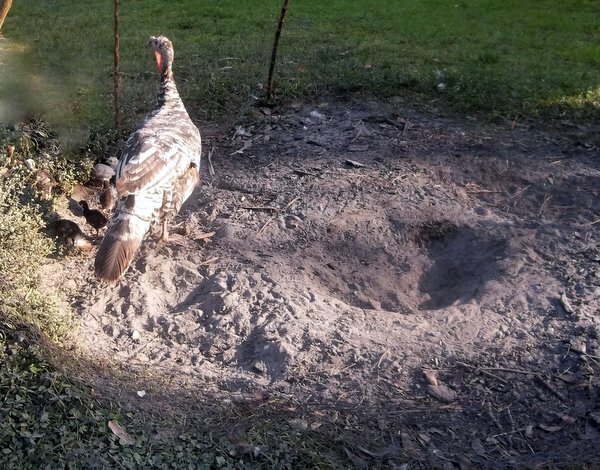 Dust Pit: For most people who own fowl, horses or goats, the dust pit is a minor issue. Still… Turkeys are consummate dust bathers, an enjoyable process in which they fluff dirt (bathe) to remove various parasites. They will seek out dry locations in your yard or perhaps the ashes of a burn pit, in which they will longue about, chirping and fluffing dust into their feathers. The result of this lounging can be a hole as much as one foot deep and two feet in length. The birds eventually stand up and shake their dust away from the dust pit. Leaving a small crater. 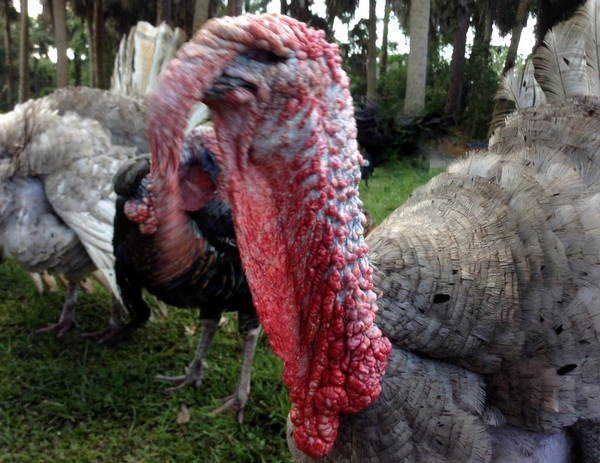 Garden: The only reason we actually grow anything but weeds in Florida’s poor sandy soil is because of the outstanding growing properties of turkey manure. However, adult turkeys love fresh garden greens, especially tomato leaves. Turkeys will voraciously assail your garden unless a three foot tall fence is installed to keep the birds out. Some of your flowering plants may not be safe either! 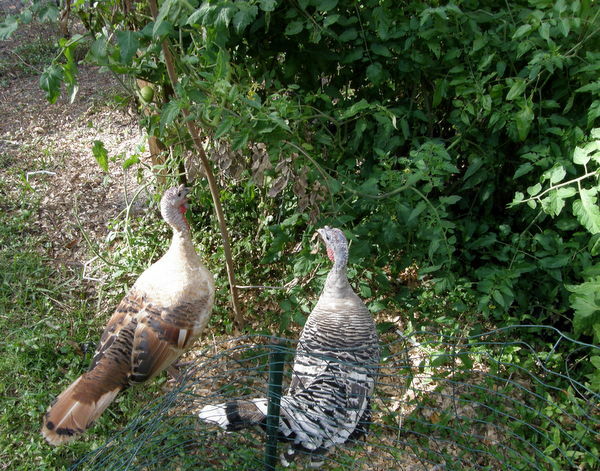 We have to install fencing around our organic gardens to keep the hungry turkeys out. (However we always leave a gap in the bottom of the fence for small turkey poults to forage for garden pests & to escape the fence). For us, the fence is a small price to pay to have both our entertaining turkey flock and organic gardens. However, if you can look out your window and see your neighbor’s magnificent garden of beautiful tomato plants…. 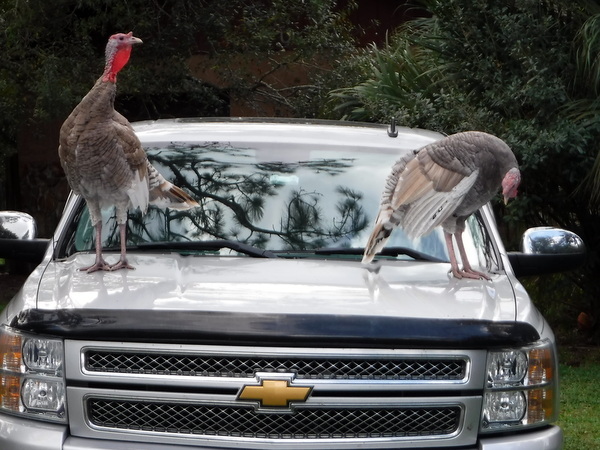 You might Not want to have turkeys. Or be a good neighbor and purchase some fence and stakes for your neighbor to install a temporary fence. If you are not on good terms with your neighbor (or wish to remain on good terms) consider owning the broad-breasted type of turkeys which cannot hop into the next yard. Gobble: In other words “the noise factor.” While turkeys are not anywhere close to being as vexing as an early morning rooster or the king of the noise maker, the peacock; the male turkeys will gobble in response odd noises. Whereas a rooster will screech into the pre-dawn for who knows what reason; the turkey Tom normally only reacts to noise.-A car door slamming shut can set off a gobble and the warbling of a fire truck or ambulance siren will send all the males into gobble frenzy at any hour. In the wild, the sound of an owl hoot might bring forth a gobble. The kids walking down our street gobble at the turkeys and have a great laugh when the Tom’s respond. 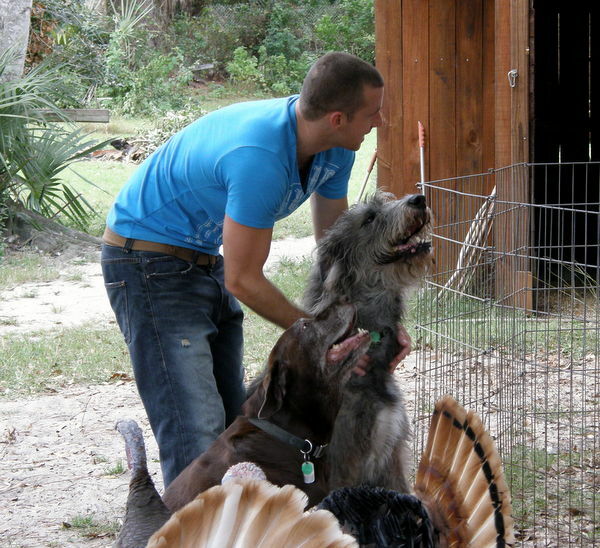 Neighbor’s dogs: We once gave away four turkeys to a neighbor a few blocks away and he greatly enjoyed the birds. In the evening his birds perched in the backyard pine tree, everything was fine for around a month. However one at a time, his turkeys flew out of their nightly roost and accidently landed in his neighbor’s yard, and the dogs promptly killed the wayward bird. 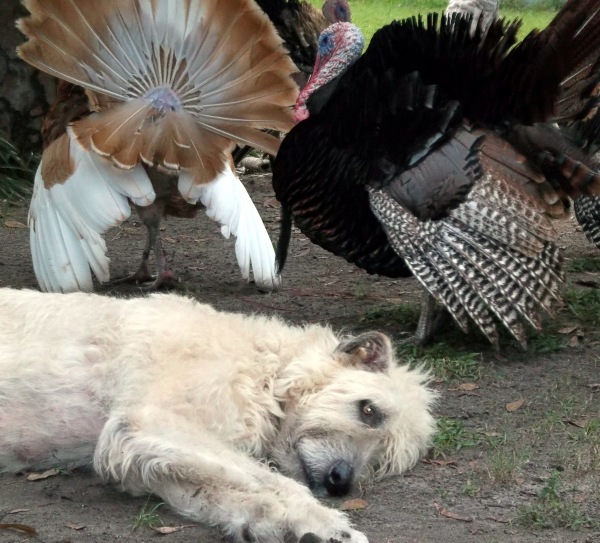 Will your neighbor’s dogs kill your new turkeys? If so, you might be a candidate for the broad-breasted turkeys which cannot fly. Then again, how will your dog react? Aggressive behavior: I do not place Aggression at the top of the list, as aggression related problems are more the rare exception than the norm. 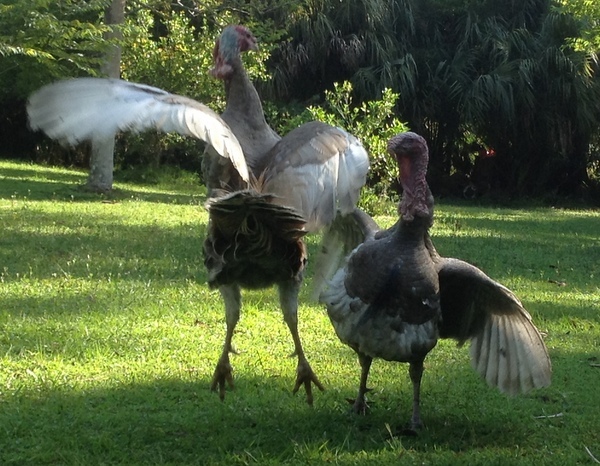 However I would be amiss to ignore the Toms fighting each other as a reason not to own turkeys. Still I will make a separate page on Toms doing battle. And problem teenagers. Had 5 turkeys (two jakes (young toms) and three hens) brought to me for "re-homing" The owners were upset about giving them up, as the grandkids loved the very friendly Blue Slate turkeys. However.....Seems like this five developed a taste to roost on the screen over the swimming pool. Zoning..Zoning..Zoning.. In certain areas you can own turkeys but not roosters--or no fowl at all. Please check your zoning laws. Last: please do not get turkeys for their eggs--Yes they are great to eat or cook with, however you will be disappointed. 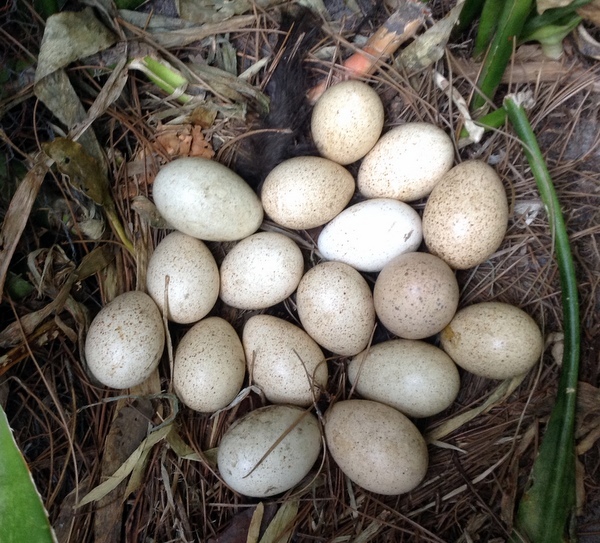 Turkeys will only lay 8-16 eggs per nest & only one to two nests per year. Egg production cannot rival a Chicken hen. Just watched a video that stated the artificially inseminated factory turkeys produced 90 to 110 eggs per year.